NOTES: Short run resin kit with vacuform clear parts. 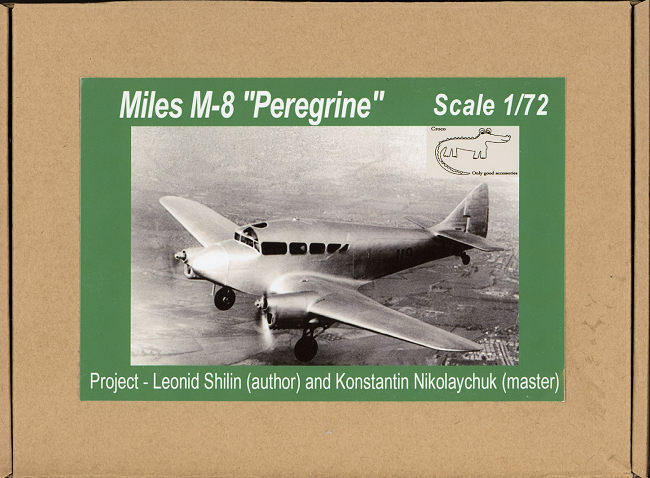 The M.8 Peregrine was the first twin-engined aircraft developed by Miles Aircraft. It was a low-wing monoplane with retractable tailwheel undercarriage. Powered by two 205 hp de Havilland Gipsy Six II engines it had accommodation for two crew and six passengers. The prototype was built at Woodley and first flown there on 12 September 1936. It was entered into the Schlesinger Race between England and Johannesburg but was not ready on time and had been dismantled by late 1937. The aircraft performed well but due to the Woodley factory pre-occupied with building the Miles Magister military trainer the aircraft did not enter production. One further example was built with two 290 hp (216 kW) Menasco Buccaneer B6S engines for the Royal Aircraft Establishment. This is very much a rare bird with only two planes being built and the prototype being flown a minimal number of hours. Still, it is a nice looking plane, somewhat reminiscent of the Airspeed Oxford. An internet search turned up some images of this plane including one in RAF camouflage. All are from the right side and there are not very many of them. Casting is very nicely done and I did not spot any casting flaws at all. There are two fuselage halves and the interior includes both nice cockpit with seats, control wheels and rudder pedals. An instrument panel and side console is also included. In the cabin there are six seats. Once the interior is closed, a vacuform section that includes the upper roof and area in front of the windscreen as well as all the side windows is attached. Having this as one piece makes it easier to assemble than installing individual windows. A spare is included. The wing has a center section with nacelles and gear wells. Two outer pieces are then attached. There is a separate rudder and tailplanes along with the engines themselves. Landing gear is somewhat complex but should be properly sturdy once completed. The tail gear piece is quite scale and I'm concerned that it may not be strong enough. For things like this, cast metal might be an option. Instructions are hand drawn and quite well done with detail images to help. There is a tiny decal sheet with the not-used racing number that one sees in some photos. it is great that folks take the time to mold kits like this. Due to its nature it is best for experienced modelers, thanks to the small parts. Speaking of which, many of the small bits in my kit were broken and that includes the prop blades, which snapped off the spinner. I think it is a case of being in a box with a lot of heavier pieces. Going through the mails, these kits are not handled gently and the boxes get tossed around a lot. One thing that might help would be to tape some of these delicate sprues to a piece of cardboard before packaging. It isn't a disaster, as those with the skills to build this kit can certainly fabricate replacements or repair what is there. One thing for certain, when done, you will have a very nice model of a most unusual aircraft.